Women's Scoop Neck T-Shirt is in stock. We will print it as soon as you order it. I love it and it fits me well, I got a small size. Thank you! The fit is on the larger side. 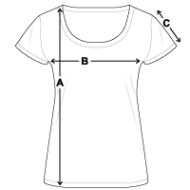 This is a scoop neck style t-shirt that is cut and sized for chicks.